Geotrichum mold is definitely not a household word for most people…and that is probably a good thing, because it can be very problematic. It is white in color, powdery looking and can spread rapidly. It has been linked to several adverse health conditions, including pulmonary infections and tuberculosis. Molds pose this kind of threat because they are invasive and produce very tiny spores. In and around your home or office, these microscopic spores can easily become airborne. The same way that asbestos fibers can be a threat when they are present in a building, so can molds. But molds are even smaller than asbestos fibers. You can’t see these tiny spores that are as small, or smaller than, dust particles. However, you can be constantly breathing them in. Once inside your body, they can wreak havoc. Like many other types of mold that grow in and around homes and other dwellings, geotrichum mold can have a negative, often severe impact on your health. People of all ages are susceptible, and children and the elderly are especially vulnerable to illness triggered by household mold. That is especially true if it continues to grow and remains undetected. It can also be a detriment to your property value, as it spreads and eats away at the wood, insulation and drywall in your home. If a harmful species of mold like geotrichum is in your home, you could be completely unaware of this unseen and unsafe issue. Just because you aren’t aware of it, however, that does not mean that you won’t adversely affected by it. Oftentimes homeowners develop chronic illnesses and do not find out until months or years later that their health problems were coming from their very own living space. That’s why it’s wise to have your home checked for mold on a regular basis. If any is detected, it can be quickly removed to ensure your well-being. Otherwise, if it is allowed to fester and grow, the removal process could involve more extensive work. In that case you may need to temporarily move out while a mold removal contractor performs a thorough cleaning and repairs any structural damage. No matter where you live or work, mold can take hold and then spread as the spores create microscopic colonies. As the U.S. Environmental Protection Agency (EPA) warns, mold can proliferate on just about any moist surface. Then, given the right conditions, it will continue to release spores and spread. Everyone knows that moldy food will thrive in a neglected and unclean kitchen or in the back of your fridge. You may have also seen how quickly mold or mildew can establish itself in a basement, closet, attic, garage, or other structure. Any place where there is moisture, especially in a temperate climate, can be a fertile breeding ground for all types of mold. Each time a colony gets started, the spores can then be moved through the air and land in a new spot. There they can grow into a new colony. Before you know it, your entire home, workshop, or office could be hosting millions upon millions of these toxic spores. The particular type of mold known as geotrichum is common throughout the world. It can grow and flourish in the dampness of your basement, inside closets, drawers, and cabinets, in bathrooms, and even in the attic or inside of walls. If mold is present where you live or work, it can be difficult to detect if it is not visible. Hidden mold can be under carpets, behind wallpaper, inside your couch, or in your HVAC ducts. Because toxic molds are often hidden, your health may be dangerously impacted by their presence, and you won’t even realize it. Some people experience chronic headaches, fatigue, itchy eyes, and vertigo because they are breathing mold spores that are virtually invisible. They may feel ill, but chalk it up to a flu virus or other ailment, wasting time and money on remedies that will only offer temporary relief. Until you identify the cause of your symptoms, there is no way you can figure out an effective treatment. Meanwhile, concealed molds such as geotrichum can saturate your living, working, or recreational spaces. You may think you or your family members have allergies or a cold, when the truth is that all of you are constantly being exposed to airborne mold spores. Follow this link for more information on health conditions that can be caused by exposure to mold in the home. 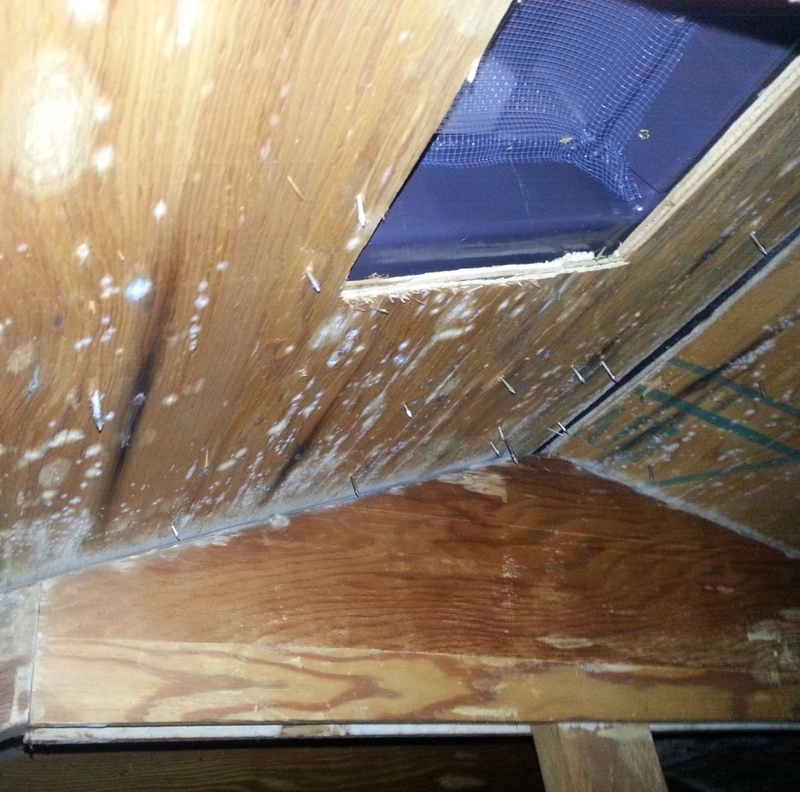 In addition to causing health issues, as mold grows on surfaces such as wood, carpet, walls, and ceilings, it can cause extensive structural damage to your home. For large mold problems, or if you are having a problem finding the mold, we recommend you have a mold remediation professional come in and take a look. They will thoroughly inspect your home, and if they find any mold, let you know what needs to be done to safely remove it. Mold remediation companies perform these home inspections for free, so even if you are thinking of removing the mold yourself, there is no harm in getting a professional perspective. To find qualified mold removal professionals in your area who offer free home inspections, just follow the link.